Ohio’s state tree and the symbol for Ohio State University’s intercollegiate athletics, Ohio buckeye trees (Aesculus glabra) are the best known of the 13 species of buckeyes. Other members of the genus include medium to large trees such as the horse chestnut (A. hippocastanum) and large shrubs like the red buckeye (A. pavia). Read on for information about buckeye tree planting and some interesting buckeye tree facts. Buckeye leaves are made up of five leaflets that are arranged like spread fingers on a hand. They are bright green when they emerge and darken as they age. The flowers, which are arranged in long panicles, bloom in spring. Green, leathery fruit replace the flowers in summer. Buckeyes are one of the first trees to leaf out in spring, and also the first to drop their foliage in fall. 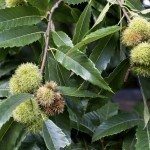 Most of the trees in North America called “chestnuts” are actually horse chestnuts or buckeyes. A fungal blight wiped out most of the true chestnuts between 1900 and 1940 and very few specimens survived. The nuts from buckeyes and horse chestnuts are poisonous to humans. Plant buckeye trees in spring or fall. They grow well in full sun or partial shade and adapt to most any soil, but they don’t like an extremely dry environment. Dig the hole deep enough to accommodate the root ball and at least twice as wide. When you set the tree in the hole, lay a yardstick or flat tool handle across the hole to make sure the soil line on the tree is even with the surrounding soil. Trees that are buried too deep are susceptible to rot. Backfill the hole with unamended soil. There is no need to fertilize or add soil amendments until the following spring. Water deeply and in the absence of rain, following up with weekly waterings until the tree is established and beginning to grow. A 2- to 3-inch layer of mulch around the tree will help keep the soil evenly moist. Pull the mulch back a few inches from the trunk to discourage rot. The main reason you don’t see more buckeyes as a yard tree is the litter they create. From dead flowers to leaves to the leathery and sometimes spiny fruit, it seems that something is always falling from the trees. Most property owners prefer to grow buckeyes in woodland settings and out-of-the-way areas.